As many as 500 information technology entrepreneurs and spouses gathered June 27 at the home of Northern Virginia Technology Council President Bobbie Kilberg to salute the nominees and winners of the sixth annual NVTC Hot Ticket Awards. The pool looked especially inviting in the 95-degree sultry summer evening, but decorum won out. Or maybe it was the outdoor bar. 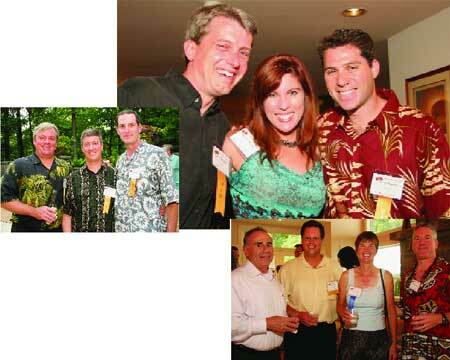 Top right: Scott Hoffpauir (left) and Scott Wharton of BroadSoft (the Hottest Management winner) and Mariette Wharton. Top left: (from left) Wayne Jackson, Marty Roesch and Todd Headley of Sourcefire. Sourcefire is the first Hot Ticket Hall of Fame honoree. Bottom: (from left) Washington Technology Associate Editor David Hubler, John Ribble of AH&T Insurance, Kathy Clark (NVTC chairman emeritus) and Bradley Rosenberg.